As an active duty member of the armed forces, leaving home can bring on a wave of emotions. 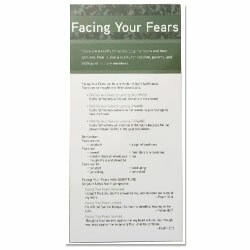 Facing Your Fears - Military Prayer Card can help you deal with the fears of military deployment in three dimensions (Backward, Upward, and Forward) as scripture guides you and your family through this time and allows you to put your fears behind you. Bea Fishback is on staff with Military Ministry of Campus Crusade for Christ. She and her husband Jim serve with the ministry in England and are responsible for a successful program of military marriage seminars and HomeBuilders Bible Study groups at America bases there and on the European continent. She is also the author of Loving Your Military Man: A Study for Women Based on Philippians 4:8.